“The last three years may eventually come to be seen as the final death rattle of the global warming scare” was the message promoted by the influential congressional committee’s official Twitter account. 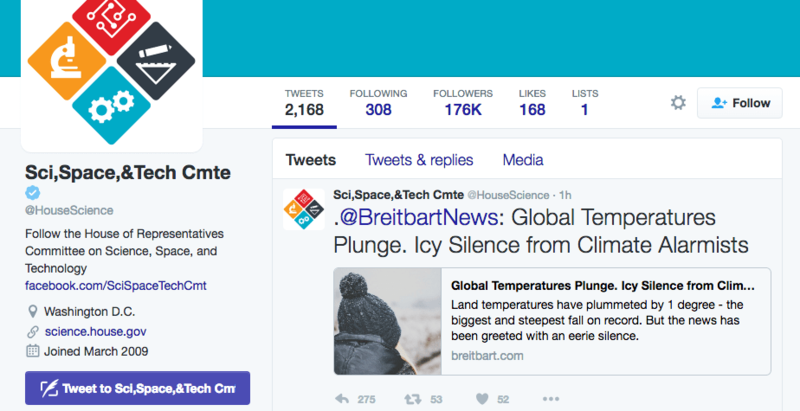 On 1 December 2016, the official twitter account of the United States House of Representatives Committee on Science, Space, and Technology tweeted an article by Breitbart News (a self-described “anti-establishment outlet for our anti-establishment times” whose ex-CEO is now the president-elect’s chief strategy advisor). The article, titled “Global Temperatures Plunge. Icy Silence from Climate Alarmists”, was little more than a regurgitation of a misleading article from the Daily Mail. It goes without saying that there is a drop in global land temperature (not a great metric for overall global warming trends) during every northern hemisphere winter, where most of Earth’s land is located. The specific claim here is that the drop was larger in range than any on record. The piece attributes this 1ºC drop to exaggerated high temperatures caused by El Niño. Some scientists, including Dr Gavin Schmidt, head of Nasa’s [sic] climate division, have claimed that the recent highs were mainly the result of long-term global warming. This argument uses a misleading oversimplification of Gavin Schmidt’s view on the demonstrably complex topic of decadal-scale surface temperature variability in order to suggest that climate change “alarmists” require 2016 to be the hottest year on record for the entire notion of anthropogenic global warming to be valid. The article suggests that the fact that an El Niño effect can be detected proves that some groups of more skeptical scientists were right all along. Ignoring the fact that the addition of eight months of mid-atmosphere data can in no way be considered evidence of global temperature trends, and that 2016 is a single datapoint on an already well established trend of warming, the remaining argument is still a red herring. The study Rose references was interested in decadal scale changes in global surface temperature — the relatively short term effects of ocean heat sinks and sources on global temperature trends. However, climate by definition represents trends over longer time periods. Anthropogenic effects on global warming are frequently discussed in terms of centuries, not decades. One salient insight is that the [global mean surface temperature phenomenon] is a surface characteristic that does not represent a slowdown in warming of the climate system but rather is an energy redistribution within the oceans. Many were quick to criticize the committee for promoting a misleading and largely inaccurate story with its origins in a flawed tabloid article. This committee has significant power over all non-defense federal scientific research, and it oversees NASA, the Environmental Protection Agency, the Department of Energy, and the National Oceanic and Atmospheric Administration, to name just a few.